When oil prices tumbled from their heights of last July (~$108 per barrel) to their lows in March (~$43), one of the most common refrains was that lower gasoline costs would function as a “tax cut for the consumer” that would benefit spending elsewhere. However, adjusted retail sales (retail sales less food, autos, building materials and gas stations) were unchanged in April (see graph below), versus expectations they would rise 0.5%. On a year-over-year basis, retail sales were up less than 1%, the slowest growth since 2009. The argument that lower gas prices would boost consumer spending sounded logical. Many investors seemed to agree, as according to data from Bloomberg Business Week, retailer stocks are up 10% year-to-date, the best among 24 industries. However, the data continues to show consumers are not spending all their fuel savings. In fact, 66 of 84 companies in the S&P 500 Index whose business relies on discretionary consumer spending and sales have reported first-quarter earnings. Sales for this group are up just 0.5%, lagging analyst estimates by 1.7%. 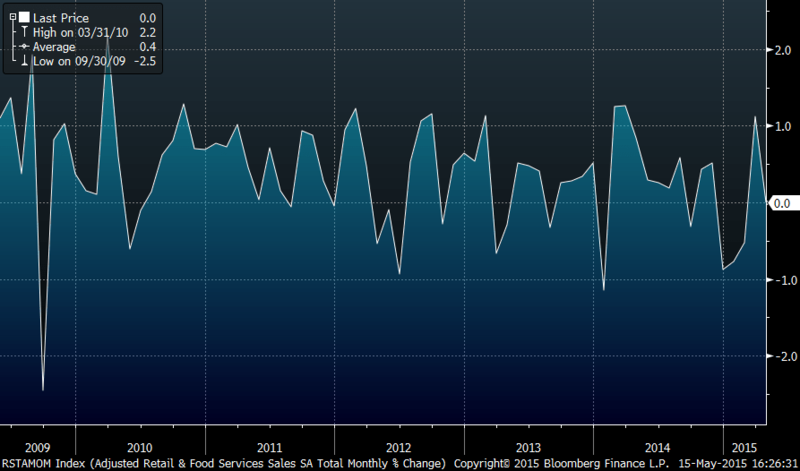 While retail sales have disappointed, the weakness seems to be focused on goods rather than services. In fact, in the services sector (particularly restaurants and bars), business continues to boom. To the extent consumers are spending their gasoline savings, they are spending it on going out to eat or drink, rather than purchasing goods. This trend also impacts employment. For example, in April 2015, non-farm payrolls grew by 2.2% on a year-over-year, three-month moving average basis. During this same period, employment in the food services and drinking places industry grew by 3.8%. Importantly, retail trade has the lowest average weekly earnings of all of the employment sectors. Perhaps this is why US personal income is growing at only 3.8% year-over-year. If we look back to 1960, the average year-over-year growth has been closer to 7%. This is made even more important because income growth is the greatest predictor of retail spending. While lower gasoline prices should benefit consumers, so far households are simply saving much of the windfall. Since November, the US savings rate has increased from 4.4% to 5.3%. The benign interest rate environment is keeping debt servicing costs near a multi-decade low, while the amount of debt remains elevated. Household debt continues to be more than 100% of disposable income. In contrast, from 1970-2000, the average was 72%; before 2002, debt-to-disposable income never exceeded 100%. After falling from roughly $108 per barrel last July to about $43 in March, West Texas Intermediate crude has rallied and is currently trading around $60. There is still much uncertainty about where oil prices will trade in the short term. Against this backdrop, it makes sense for consumers to question how long lasting the oil price decline might be. The slower-than-expected growth in retail sales and the sluggish economic data makes it likely that the much anticipated normalization of interest rates will be gradual. While the Fed could increase rates in June, it seems more likely that the first rate hike will not be until at least September. Consumer preferences are also difficult to predict, which has kept the client exposure to consumer discretionary stocks more modest. Our philosophy remains centered on identifying securities with the potential to deliver long-term gains to client portfolios.